Arrive Bangalore, the Garden city of Karnataka. 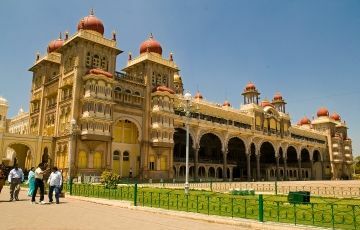 On arrival you will be met and transferred to Mysore to relax. Later proceed for the sightseeing of Mysore. 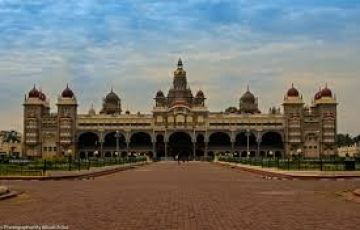 Visit the palace of the Maharaja built in 1911-12. 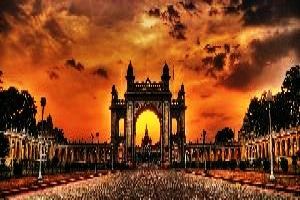 The palace is of harmonious syntheses of the Hindu and Saracenic styles of architecture with archways, domes, turrets, colonnades and sculptures which are magnificent. Visit the Art Gallery; drive upto Chamundi hill to see Chamundeshwari Temple that offers a panoramic view of Mysore. On the way back, see the Nandi Bull. Overnight Mysore. After breakfast proceed to Kabini River lodge. Check in on arrival and relax. After lunch join wildlife tour at 16.00hrs and return at 18.45hrs & at 19.30hrs watch wildlife film. Dinner and overnight at the resort. At 0630hrs after coffee / tea proceed to wildlife sanctuary for coracle (local boat) and elephant ride (subject to availability of elephant). 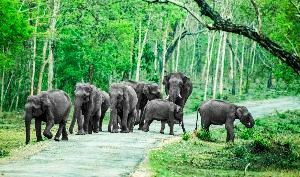 After breakfast check out and proceed to Bandipur wildlife sanctuary (3 hrs / 80 Kms). On arrival check in at Tusker Trial and proceed for lunch. Wild life safari at around 16.00hrs. Overnight at the resort. Morning visit Mudumalai Wildlife Sanctuary (3hrs/100kms). Proceed for a Elephant ride (Subject to availability) or visit to local villages. Later proceed to BR Hills, check in at B.R.T Camp and proceed for lunch. Evening Wildlife safari. Overnight at the camp. Morning proceed for wildlife tour and return at 09.30hrs. Proceed for Breakfast. Later visit the temples and local Soliga village. Evening Safari. Overnight at the camp. Morning safari or trekking depending upon your interest and return to camp at 09.30hrs. After breakfast proceed to Cauvery Fishing Camp (3hrs / 100kms). On arrival check in and proceed for lunch. Afternoon fishing and evening free. Overnight at Camp. Morning coracle (local boat) or motorboat ride, fishing, etc. breakfast and checkout at 11.00hrs, proceed to Bangalore (03hrs/100kms) to catch your flight / train. » Terms : 25% advance payment has to be paid before three months from the date of tour confirmation. If the tour is on PEAK SEASON dates, then the advance has to be made before 5 months. The payments once remitted is non refundable. Inclusions referred in the itinerary only being offered & nothing extra to be claimed Hope the above is clear. If you have any further clarifications, feel free to call us or mail us at any time. it was great trip. loved the hospitality of team. specially shruthi and driver shakthi. it was booked from india holiday travel coimbatore.